Bourdelle is generally acclaimed as the most important heir to Rodin, in whose studio he was an assistant from 1893 until 1908. Upon his separation from Rodin, however, he sought direct inspiration in the work of the famous Neoclassical painter Ingres, a native of the sculptor’s own hometown of Montauban. Bourdelle sculpted a portrait of Ingres in 1908 while developing Penelope, the pose of which, based on ancient Roman models, was among Ingres’s favorites. In Bourdelle’s earliest versions, Penelope held a spindle to identify her as the steadfast wife of Odysseus, who, in Homer’s epic account of the Trojan War, endures the long absence of her warrior husband by weaving a shroud. 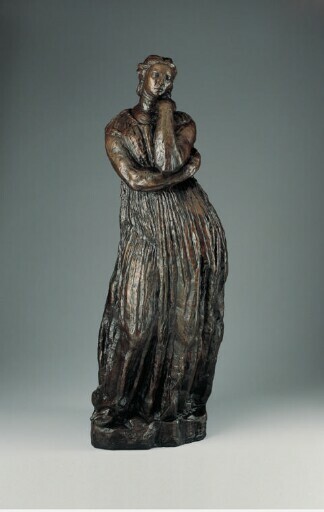 In the fully evolved, half-scale Kimbell version, the figure’s identity as Penelope is manifest only from the ancient Greek costume and meditative pose. Both the elimination of the spindle prop and the pose with arms brought close to the body contribute to the sculpture’s columnlike silhouette. Indeed, the heavy woolen pleats of Penelope’s chiton are like the fluting on a Doric column. purchased through (Pintura Establishment, Vaduz, Liechtenstein) by Kimbell Art Foundation, Fort Worth, 1969.